Happy Week of the Young Child! I thought I'd celebrate by sharing some fun ideas to help you follow along with NAEYC's themed days. For more info about the Week of the Young Child celebration you can visit NAEYC's website, but I'm going to jump right into the fun! I'm loving music monday - Music can change your mood in an instant, so it's a toll that I used in the classroom all the time. On gloomy days when we're stuck indoors I put on happy, upbeat music. When the kiddos really need some calm, I put music that is soothing. I fully believe in the power of music, and I have a great activity that shows you just how music can influence the way we feel. The idea of the activity is very simple, children draw while you play music in the background. The children should let the music lead their drawings, and throughout the experience you can change the music that you play. Cover and entire table in paper and let the children move around the table as they draw - this helps them recognize the different tempo changes because their bodies are moving to the music at the same time that they are drawing. Give each child their own piece of paper to start with, and each time you change the song the children can pass their paper to the person next to them. This creates an opportunity for community artwork, and each child gets to work together so that everyone has a finished piece of art at the end of the experience. 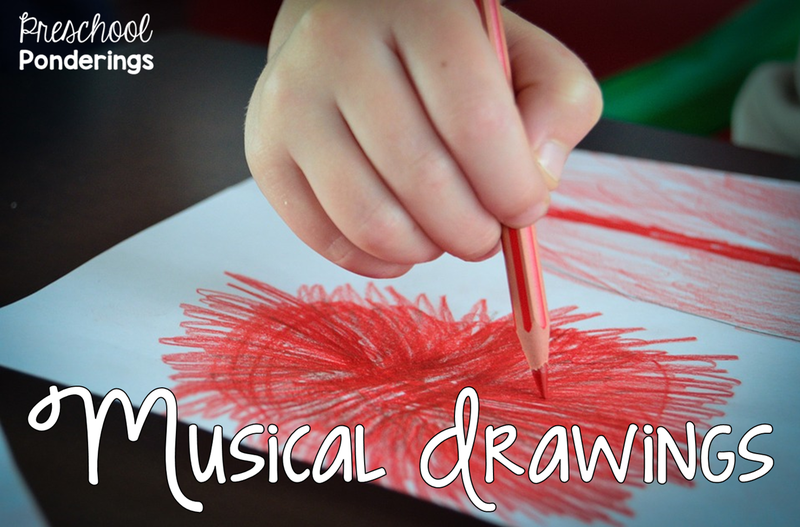 Both of these experiences are a fun way to incorporate music into your art activities, and they are sure to cause lots of giggles! For a couple of fun preschool playlists, check out this post!